Our church youth group used to play funny games all the time. I think this one would be fun for any teenage party, because teenagers get a kick out of trying to embarrass others! Heh. The object is the person who is "it" has to pick one person in the group and get them to smile. That's it! The person who gets picked has to say "You know I love you, but I just can't smile" 3 times after the person who is it asks them "Smile if you love me." Now the person who is it can try absolutely anything (of course, we kept it very clean being in a church group, but I'm sure older people could step it up a notch) to get the person to smile. If the person ends up smiling, then they are "it" and they have to pick a person. They continue trying until they make someone else smile. Playing these kinds of group games is so much fun! I love this idea of playing this with youth groups. It's hard to get teenagers playing games but I can see how this one would keep them interested. Thanks for contributing. Join in and write your own page! It's easy to do. How? Simply click here to return to Theme Party Games. 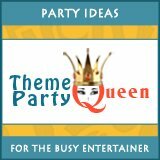 Want To Stay In Touch With Theme Party Queen? Our goal is to create a community of like-minded people who like to share ideas and who are open to making new friendships. We would love for you to join us today.